This Windows Insider story actually had its start over 200 years ago on a small island off Nova Scotia, Canada. In 1799, a deep, multi-levelled shaft was discovered on the shores of Oak Island, a long-reputed hideout for pirates. Further digging uncovered a mysterious stone tablet hinting at riches further below. That tablet would inspire over 200 years of treasure hunters, including President Roosevelt and other famous investors. Fast forward to 2018. Two brothers from Michigan, USA, launch the largest Oak Island dig yet. To help with the dig, the newest treasure hunters enlisted services from Irving Equipment Limited — a national heavy lift, specialized transport and deep foundations service provider. 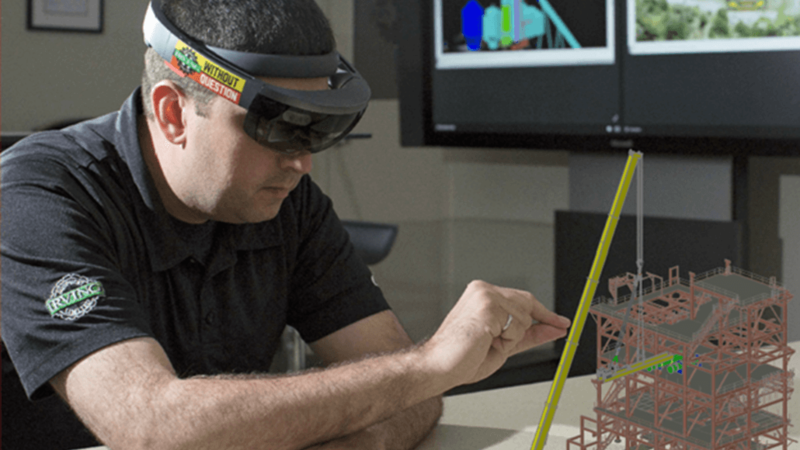 Irving Equipment then engaged Kognitiv Spark, a Windows Mixed Reality developer, for innovative planning support. Data from drone surveys of the Oak Island site were fed into Irving Equipment’s proprietary lift planning software, CraneCADTM. Kogntiv Spark then used its application RemoteSpark to create a 3D hologram. This hologram was used as a visualization tool to collaborate on the dig and fine tune their approach. The version of RemoteSpark that was used to create that 3D hologram had been recently updated with the help of Windows 10 Insider Preview builds. As it turns out, it was an important update. One of the challenges with creating RemoteSpark was moving 3D images from HoloLens devices into a compelling 2D view on Windows 10 PCs. “RemoteSpark is used to transmit extremely complex visualizations between teams and we needed to make the 2D view more dynamic,” says Ryan Groom, co-founder of Kognitiv Spark. The only problem was timing: the team had first learned about the Fluent Design update at a Microsoft Build event but it would be months before the update would be available publicly. And that’s where Windows 10 Insider Preview builds were useful. With Insider Preview builds, the RemoteSpark team got the best of both worlds: they could leverage the benefits of leading-edge innovations in Windows while also giving their clients the time needed to get familiar with the updates and train workers in the field. Kognitiv Spark continues to use Insider Preview builds to keep their Remote Spark application up-to-date with the very latest Windows features. That kind of speed and innovation has helped keep business prospects growing across multiple industrial industries, including energy exploration, construction and military operations. Microsoft has also recognized the company’s innovative work. Kognitiv Spark recently won a 2018 Impact Award from Microsoft Canada. They’ve also joined Microsoft and some of its biggest partners on HoloLens presentations across Canada. As for their treasure hunting customers back on Oak Island, they too have come out ahead — the group recently announced that they had uncovered a priceless, 500-year-old gemstone brooch near the site. It was the first treasure to be found there in almost 220 years.